I am a single mother to 2 wonderful boys and 2 male dogs. My boys are 13 and 11 year whom I adore spending time with. Both of my boys are so different and I’m doing my best to raise gentlemen. Both my dogs Dexter and Curry were rescued one from a family member who rescued his momma and one from an organization here in San Antonio SNIPSA. I am the youngest of 4 girls and I have 9 nephews and 1 niece on the way! I was the last girl in my immediate family so we are excited to spoil a little girl. We adore all of our boys but now we can buy bows and sparkly things! We are a very close family and we love to spend time together! The biggest accomplishment and obstacle I’ve overcome is being a single mother with single income coming into the household. I am able to be a part of my son’s lives and work to maintain a roof over our heads, food on the table, clothes on our backs, attend church every Sunday and volunteer with our student ministry and attend most if not all of their school functions. Being a single mother is not a crutch for me it is my inspiration. I have good and bad days but I prefer to look for the good in all of it! I have purchased GameStop eCertificates that helped me purchase birthday/Christmas gifts for my boys and family. Kohl’s eCertificates helped me purchase Christmas outfits for my mom and sister, Nike eCertificate for my picky brother in law and restaurant eCertificate for my friend who takes my boys home from school every day. I messed up my credit as a young girl and I’m still trying to repair it so I don’t have much in credit. Zebit has allowed me to buy special gifts for my loved ones and pay it back in payments. One example is I love to give and help others. Sometimes I don’t have the means to give financially so Zebit has allowed me to do this. I was able to purchase a restaurant gift card for my friend to take her family out. She takes my boys home from school every day and doesn’t expect anything in return. My tip was given from Zebit themselves if you would rather purchase items that you can’t find on Zebit purchase the eCertificates and go shopping at the store for the items. For example, last year I wanted to buy the Wii-u that Zebit had, but by the time I had the down payment they were out of stock. I reached out to see if they would get more in and they were not. However, they suggested I could buy enough GameStop eCertificates to cover the item and purchase the item at GameStop! That was genius and I got to pay it off in 6 months. It feels really good to be able to reward my children at times. Thank you! 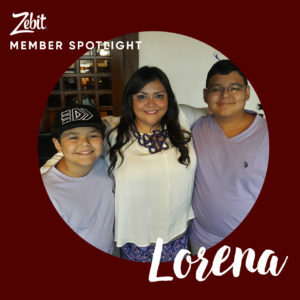 For being chosen as Zebit’s Member Spotlight, Lorena selected a $50 Kohl’s eCertificate.